I tell my kids to leave important items in the same place when they come home so they'll know exactly where they are when they need them next. Unfortunately, I do better at preaching than practicing. I'm always leaving my keys on a counter or in my gym bag. And my kids don't help matters by making off with my phone so they can play Angry Birds. If you have similar issues, personal item locators help you hone in on the position of your keys, cell phone or even that TV remote that always seems to have gone missing. Item locators are two-piece systems: There’s the small tag you attach to the thing you want to track, and the receiver that tracks them. Before using the tags, you register them with the receiver. Some systems come with pre-paired tags, others let you input the name of the tagged item into the locator. When an item is lost, the locator will search for the item’s unique tag and give you auditory and/or visual directional signals to point you in the right direction. For a basic model, check out the Click ‘n Dig! Key Finder. 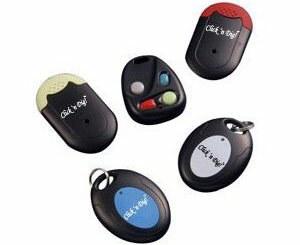 The system comes with two key-fob tags and two .2-inch thin receiver tags that you can affix to items with double-sided tape. To find an item up to 60 feet away, you just press the colored button the matches your item’s tag and the tag will beep. 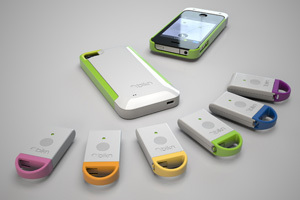 Locate up to 8 items with the BiKN for iPhone 4. Set each tag so you can find it on demand or if it wanders out of range (50-100 feet inside and up to 500 feet outside). Since the receiver resides in the case, you can use any tag to locate your phone—even if your phone is dead. When a Tag's battery runs low, it can be recharged via micro-USB. Track your misplaced keys by using your Android or BlackBerry phone and vice versa. Once paired via Bluetooth, If phone and keys are ever separated, the keychain Tag and phone both make and audible chime. Users can also just press a button on either the Tag or in the app to manually set off the chime. 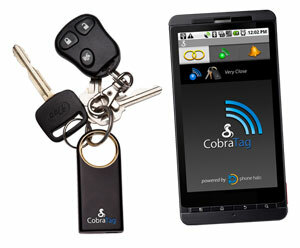 The Cobra Tag app also marks the GPS coordinates where the devices separated and can automatically send that location via e-mail and social networks, so you’ll know exactly where the phone or keys were left behind. When the new low-power Bluetooth version of the product ships later this year, it will only need two charges per year. Hello, there is a product called Find One Find All…(FOFA) which is really nice because you can call any device from any device. They have keys from 1 to 6 but from what i remember you can call double digits too. It’s much like Click ‘n Dig! Key Finder but a lot better IMHO. Find One Find All (FOFA) Still available - 14 years! Thank you for the mention. FOFAs are 2-Way and are a great help to folks like me who lose things. There is no “Base” as such ..... If you have 4, 6 etc. of them, they can all find each other!